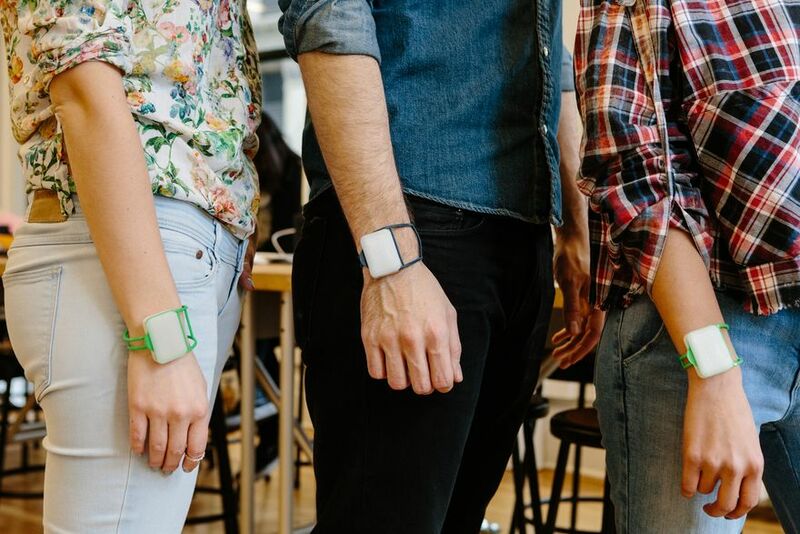 Students at The New School's Parsons School of Design and innovators from Panasonic Corporation have teamed up to create wearable technology pieces and experiences that address wellness needs. Göbie is a bracelet designed to improve social wellness via play (Photo / Matt Matthews). NEW YORK/OSAKA, March 8, 2017 — The New School’s Parsons School of Design and Panasonic Corporation will debut wearable technology pieces and experiences that address wellness needs at SXSW Interactive in Austin, Texas. The prototypes — jointly created by students at the leading art and design school and Game Changer Catapult, Panasonic’s innovation acceleration team — can be tested out by SXSW attendees at Panasonic House at Parkside, 301 East 6th St., Saturday through Monday, March 11-13, 9:30 a.m.-8 p.m. and Tuesday, March 14, 9:30 a.m.-5 p.m. Working together at Parsons, members of Game Changer Catapult — business leaders, engineers and a UX designer at Panasonic — and students from Parsons’ MFA Industrial Design, MFA Design and Technology, and BBA Strategic Design and Management programs have designed garments and services focusing on enhancing sleep and social interaction. Göbie is a bracelet designed to improve social wellness via play. Using haptic feedback, gesture recognition, and a visual LED language, Göbie encourages users to interact outside of a screen interface. Its connected app recognizes when other Göbie users are near and prompts a spontaneous play experience that fosters a sense of community no matter the location. SLEEPWISE is a compact wearable device that helps users create a personally designed environment, at home or on the road, to get a better night’s sleep. Its sensing device and app controls the user’s smart home and IoT devices to create the conditions for his or her preferred environment. Parsons School of Design, founded in 1896, is one of the leading institutions for art and design education in the world. Based in New York but active around the world, the school offers undergraduate and graduate programs in the full spectrum of art and design disciplines, as well as online courses, degree and certificate programs. Critical thinking and collaboration are at the heart of a Parsons education. Parsons graduates are leaders in their respective fields, with a shared commitment to creatively and critically addressing the complexities of life in the 21st century." Game Changer Catapult is an initiative of Panasonic Corporation Appliances Company to accelerate efforts in developing new businesses that focus on home electronics and for training personnel who can lead the way in this field. In recent years, new and innovative products and services have drawn the attention of consumers. Amid this environment, Panasonic has promoted open innovation, which encourages external collaboration and co-creation and internally, bottom-up discovery, development, and strengthening of new business ideas. As part of this initiative, in May 2016, Panasonic established for the first time a system that encourages employees to submit new business ideas. Under the theme, “Game Changer Catapult,” which promotes a shift towards unconventional businesses, many innovative business ideas were submitted and finalists were selected on July 21, 2016. In the future, Panasonic will dedicate its resources and know-how to these new business ideas to get them rolling quickly. Moreover, by introducing these new ideas to the market at exhibitions, etc., during their early stages, Panasonic will reflect market feedback to its businesses and products. For more information, follow Game Changer Catapult on Facebook @gccatapult, on Twitter @gccatapult, and on Instagram @gamechangercatapult.